Bizarre though... I thought it was just a loop that didn't go far enough, but this is actual sabotaging of the extra sides. You seem to have done quite a bit of research into Dune II. I couldn't get through, since I couldn't get IDA to link to the the data sections correctly, which destroyed all string references in the code... they're kind of a vital lead to getting started with identifying functions. We had another problem concerning the fact the ingame main menu strings aren't centered in the european version (they are in the American version though). I wanted to fix that by tracing the IDs from the strings file for the strings used on the main menu (a method which works fine in C&C), but these string IDs are also in separate data sections here. Do you think you could help us out with that? Once I know where to look I'll probably be able to do the hack myself. hmm, which version is the european version? this takes a few arguments, such as a pointer to the menu data (ptr to string ptrs stored on the stack before). I'll look into that when I got some more time. Do you have a correctly linked IDA database I could use though? Or a way to link these sections so the references work? I really can't work with it as it is now... the memory manager screws it all up when loading the file. 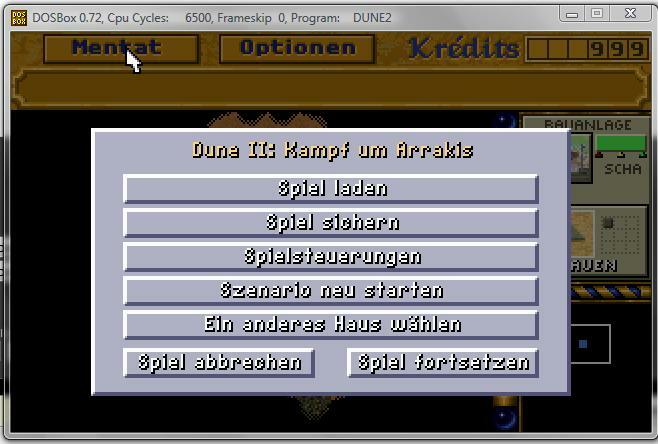 dune2_us_1.00.zip - US 1.00 version. dune2manual.pdf - the game manual. Needed to pass the 'security checks' ingame. Hacked versions of the exe have been going around, but right now I don't know where to find one to see how the security thing can be disabled. 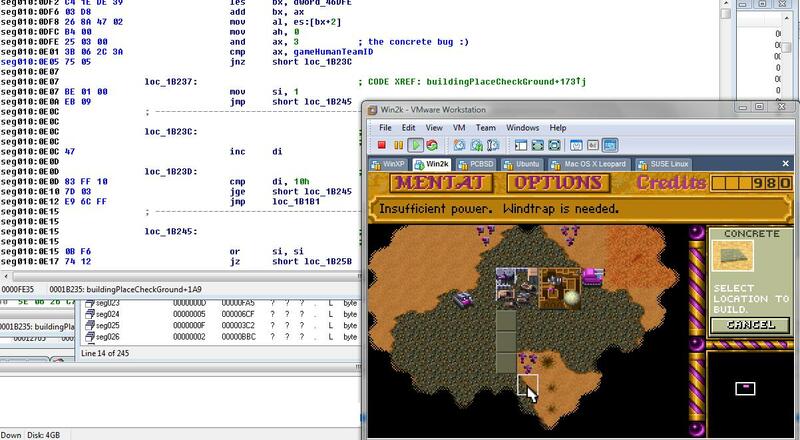 The editor was requested by MrFlibble so he could port Super Dune II to version 1.07. It's made with the informaion from an existing Dune II v1.00 editor. The exe editing thread has some more information related to the hardcoded data of houses and the main menu. The menu text that is centered is not on the title screen, but in the menu that you get when pressing the "Options" button during a mission. The menu items there, as well as in the load game/save game dialogue, are centered in v1.0, v1.07US and v1.07HS, but not centered in v1.07EU. This is because they made the menu items numbered for French and German (e.g. "1. Spiel laden" etc.) in that version, and a numbered list doesn't look good when the lines are centered. That is probably the HitSquad version. Does my editor identify it? want me to post my exe? Hmm... does it have the system to select the first differing letter as keyboard shortcut? If so, on that German main menu, the shortcuts to the options should be s, p, i, z, e, l, and then either space or f.
No... take the French game. If the first unit command is "Attaquer" and the second is "Aller á", they both have the first starting letter... so after assigning the "A" to the "Attaquer" command, the EU game automatically determines that "L" is the shortcut for the "Aller á" command; it takes the first letter of the string that's not already in use by another command. I think it does not happen both in the HitSquad version and in the US version (if you set it to German or French). The HitSquad version is definitely half-baked in terms of other languages.